The first phase of construction work as part of the £29m scheme in Rotherham will begin in Maltby. The Council is bringing forward some of its "more challenging" sites using a innovative development model. Wates successfully secured a multi million pound tender and will act as the Council's development partner. 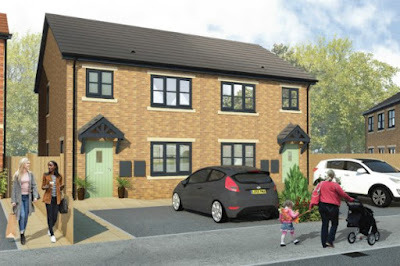 Rotherham Council has appointed Wates Residential to develop 217 new homes, 98 of which will be council rented homes and five will be adapted for adults with learning disabilities and young vulnerable people. The scheme also includes properties for sale, shared ownership and rent to buy and will be built across seven sites in Maltby, Canklow, East Herringthorpe and Dinnington. The first phase of construction work will begin on Braithwell Road in Maltby to provide 83 properties for sale. The first of these homes are expected to be ready in Spring 2019. Phase one of this construction programme will also see development start on Conway Crescent and Farnworth Road, East Herringthorpe and Gaitskell Close, Maltby. Following this, phases two and three will commence in Dinnington and Canklow in 2018 with an expected completion for all 217 homes in 2020. The Wates Group is one of the largest privately-owned construction, development and property services companies in the UK and has committed to delivering a variety of training and employment opportunities for local people. As part of its preparatory works, Wates has engaged local suppliers and sub-contractors to ensure that the Council's investment provides a boost for the local economy. Cllr. Dominic Beck, cabinet member for Housing at Rotherham Council, said: "Rotherham is one of the largest stock holding authorities in the country and one fifth of our residents live in social housing. Making sure these residents have access to affordable and warm homes, and those that are adapted to meet their needs, is vital. The 98 new Council homes will help us to deliver the high quality housing that we need. "We also have ambitious growth plans to regenerate the borough and make it a place where more people want to live, work and spend their leisure time. This development with Wates Residential is a huge step forward for the Council and we are delighted to see work getting underway and our vision becoming reality." Jo Jamieson, managing director of Wates Residential North, added: "We have been working closely with Rotherham Council to ensure that our partnership helps to meet the borough's diverse housing needs. The strategy now being implemented will support vulnerable members of the community while also providing an affordable foot on the ladder for first time buyers. "Today's sod cutting ceremony is symbolic of the progress being made on this ambitious investment programme. Our team starting on site is a huge step forward for the creation of the new homes, as well as for the long-term benefits the local community will feel as a result of this new development." Last month, the Council's cabinet approved the authority's plans to use £6.81m of grant funding it secured through the Homes and Communities Agency's (HCA's) Shared Ownership and Affordable Homes Programme (SOAHP).